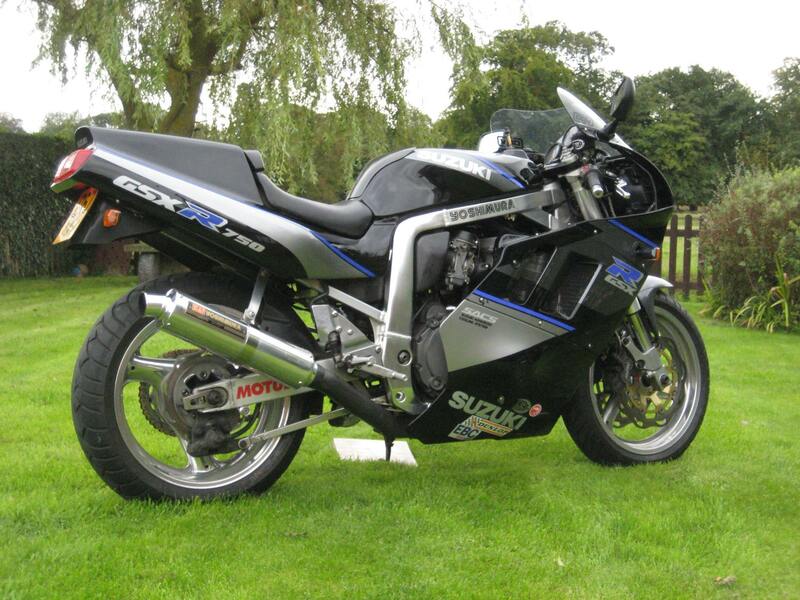 If you’re a sponsor, racer, trackday enthusiast, or simply into or know someone who is into bikes and are interested in having a painting commissioned then this is your opportunity. 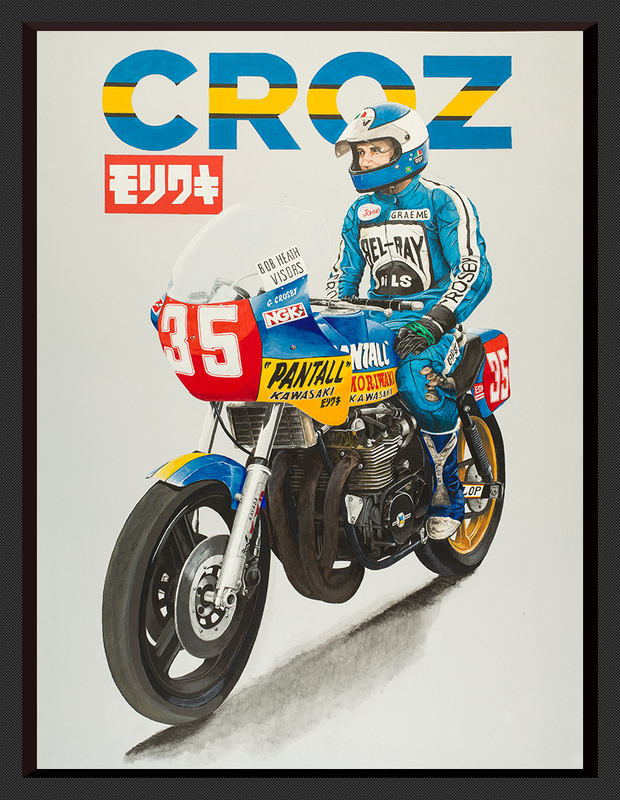 The painting on the right is, for those of you not old enough to remember the legend that is Graeme Crosby, a truly inspirational racer. 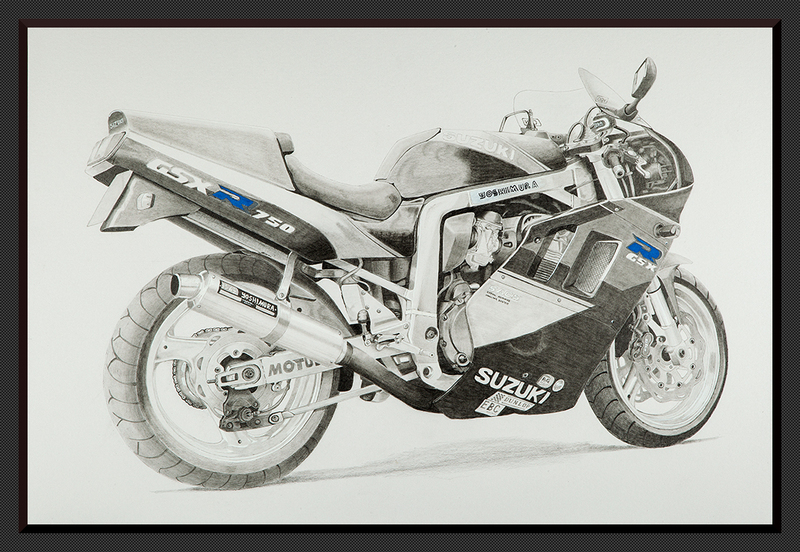 The one below is a pencil drawing of John Yates own gsxr 750. It could however, just as easily be yourself or someone you know. All I need to produce a work of art to this quality is a high resolution/high quality photo. As a high resolution photo allows me more detail to work with. The photo can be taken anywhere, driveway, garage, pits, road, track etc. It can be of one or more people. There are, really very few limitation. The choice then is whether you want the piece to be in pencil or paint, either is available. All original artwork is done on A2 or A1 size board, but these can be resized if necessary. Realities of available space apply to all of us. I’ve been asked on countless occasions why go to the trouble of painting, why not just have a photo enlarged. To me, paintings are individual, personal in a way a photograph could never match. There is a soft tactile feeling to a piece of art. The idea is that this should be something that you would want to keep, that it should show you in your best light, not just be a stark impression of a moment in time. Without wishing to sound like I’ve gone soft if your loved one wrote to you expressing their feelings, would you rather it came in a hand written letter, something that you could touch, feel and smell or simply via email. Ultimately it should be something you can be proud of. Whether you hang it in your house, garage, office or workshop. or just ring me on 07541572018 to discuss your ideas. Nothing ventured, nothing gained.